What is the oestrous cycle? It is a 21-day cycle which is marked by the recurring appearance of oestrusAlso known as heat, is the physiological and behavioral phenomena which precedes and accompanies ovulation in female mammals. or heatAlso “oestrus”. Physiological and behavioural phenomena that precedes and accompanies ovulation in female mammals.. This is when ovulationExpulsion of an ovum from the ovary in female animals. occurs. When does sexual activity start? Sexual activity starts at pubertyTransition between youth and adulthood, characterized by the development of sexual characteristics, accelerated linear growth and acquisition of reproductive functions., when the animal has reached 40 to 45% of its adult weight (around 200 kilograms). Heifers are between 6 months and 1 year old at this stage. 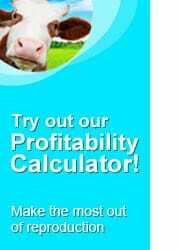 Dairy heifers are more precocious than meat breeds. 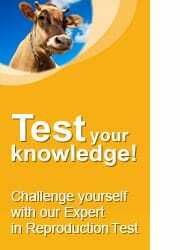 How long does it take for heifers and cows to complete a full cycle? Cows: around 21 to 22 days. How do we know the cow is at heat? 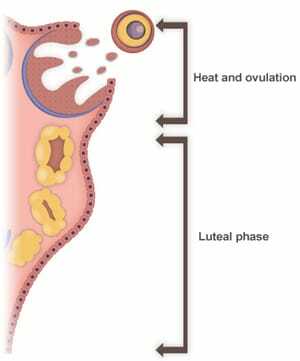 The oestrusAlso known as heat, is the physiological and behavioral phenomena which precedes and accompanies ovulation in female mammals. or heatAlso “oestrus”. Physiological and behavioural phenomena that precedes and accompanies ovulation in female mammals. period can last from 6 to 30 hours and can be noticed by the presence of behavioural changes. After heatAlso “oestrus”. Physiological and behavioural phenomena that precedes and accompanies ovulation in female mammals. and ovulationExpulsion of an ovum from the ovary in female animals., the cycle continues with the formation of the corpus luteumOrganelle formed after ovulation of a dominant follicle. Its thick wall is formed from progesterone-secreting cells. It is the sign of the cyclical activity being maintained in the event of pregnancy., which corresponds with the luteal phase. Growth period: 4 to 6 days during which it remains insensitive to prostaglandinSubstance derived from a fatty acid, present in many body tissues and involved in numerous biological processes (contraction of the uterus, inflammation, blood clotting, etc.). action. Period where activity is maintained: 10 to 12 days. LuteolysisRapid degeneration of the corpus luteum in the late luteal phase under the action of prostaglandins F2alpha secreted by the uterus when fertilisation does not occur. period: finally, if fertilisationUnion of a male gamete (sperm) with a female gamete (ovum) to give an egg, or zygote. has not occurred, there is a period of luteolysisRapid degeneration of the corpus luteum in the late luteal phase under the action of prostaglandins F2alpha secreted by the uterus when fertilisation does not occur. which lasts for around 24 hours.